Andromeda Romano-Lax is the author of The Spanish Bow, a New York Times Editors' Choice that has been translated into 11 languages, The Detour, and Behave, as well as numerous works of nonfiction. She teaches creative writing and is a co-founder of 49 Writers, a statewide literary organization. She lives on Vancouver Island. "In Plum Rains, the world that Romano-Lax engineers is a character in itself, impossibly complex and daunting in its believability." 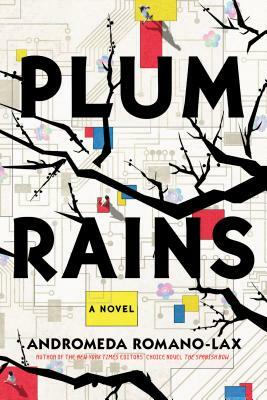 ​"​Plum Rains is a blistering social commentary of what the not-so-distant future of the world's fastest-ageing society will look like—told with quiet contemplation and a lot of heart.​"
"​In this profoundly inquisitive and compelling novel, Romano-Lax sets timeless human dilemmas involving love, racism, misogyny, violence, grief, and dissent against environmental decimation, the daunting ethical questions raised by burgeoning AI, and consideration of the very future of humanity." "The secrets we keep and the prejudices we navigate rise to the surface of Andromeda Romano-Lax’s lovely, heartrending near-future novel . . . Dark realities (including human trafficking) loom, but it’s the vulnerable-but-tough and irreplaceable characters who stick with you." "This quietly thoughtful read sits at the crossroads of literary and speculative fiction and will attract readers of both genres, especially those interested in exploring the consequences of present-day policies and the boundaries of artificial intelligence and human/robotic relationships." "Romano-Lax proves herself a gifted writer, creating beautiful imagery . . . ​A story of human connection and finding joy after trauma." "The writing is so subtle, so effortless, that your heart doesn't break so much as quietly dissolve into tears."